John Charles Thomas. Lawn Resident Survey. 1995 December 21. John Charles Thomas, future Justice of the Supreme Court of Virginia, was one of twelve blacks out of 1400 enrolling students in September of 1968. He graduated with distinction in 1972 and received his degree from the law school in 1975. In 1992 he returned to give the commencement address and urged the new graduates to become part of the reformation of America just as Jefferson had been a leader in the formation of America. 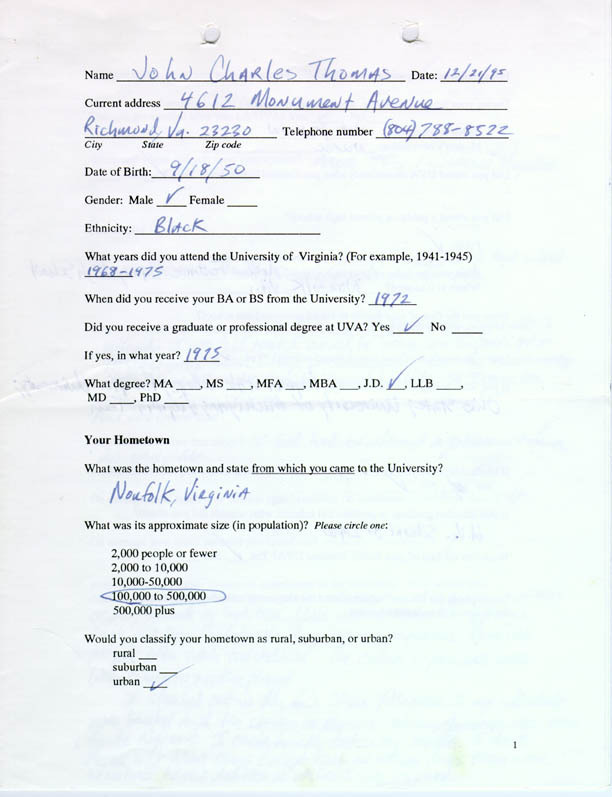 In a survey of Lawn residents filled out in 1995, Thomas recalled outstanding teachers Kenneth Elzinga, John Graham, and Norman Graebner; rigorous course work for which he was initially unprepared; issues he cared about such as getting more books by black authors in the Library versus the social and fraternity concerns of most students; and his deep feelings for a "University that really did not want me to be there back in 1968 but which I call my own anyway."